Showing results for "ipod fm transmitter"
GRIFFIN ITRIP FM TRANSMITTER FOR IPOD FEATURES: - Play iPod music through any FM radio or car stereo - Powered via iPod - no batteries required. - Uses any FM frequency - selected directly from the iPod. - Allows charging while in use. REQUIREMENTS: - Apple iPod with Dock connector. 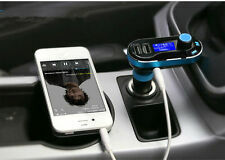 BOX CONTAINS: - iTrip FM Transmitter for ipod. - CD-Rom & Quick Star guide. eBay Scosche FMT4R Universal Wireless FM Transmitter Play iPod/Phone over Radio! Create your own Radio Station, Play your music to any FM RADIO!Wireless FM Transmitter with Remote Control Car Charger For iPhone 4 4S iPod Color: Black BRAND NEW in Bag Allows you to play the music that is ON the Device to a RADIO STATION of your choosing !Please Look at Pictures, What U See is What You Get!I Strive for 5 STAR (100%) Customer Satisfaction!